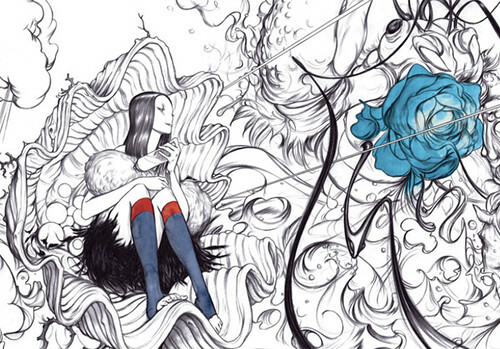 Following in the steps of Takashi Murakami for Louis Vuitton, illustrator James Jean is working for Prada. As a longtime fan of Jean’s I was eager to see the designs, and especially the promotional video! Unfortunately, I was super dissapointed. While the concept sketches and production drawings on Jean’s blog look wonderful, it really does not do it for me in motion. The 3d rendered objects just don’t pick up the subtle linework of Jean’s drawings for me. In fact, it sorta reminded me of Second Life at times. 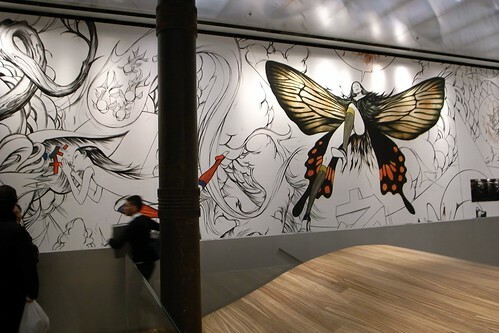 That said, the print work that Jean did for Prada is amazing.